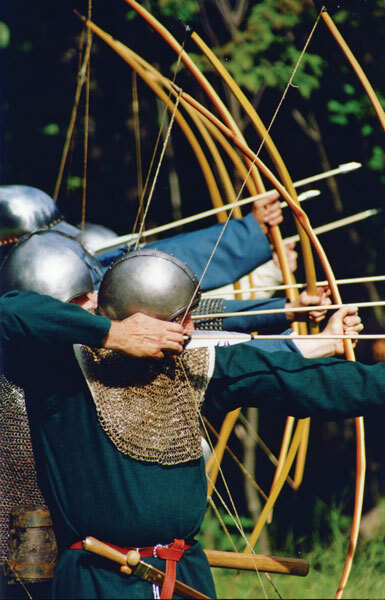 English archers were familiar with their weapon, often brought up from childhood shooting at targets and on the hunt. Constant practice was required, not only to maintain one’s skill, but simply to stay in condition to draw the heavy war bow. A competent archer should have been able to loose at least 6 aimed shots a minute at a bare minimum. This is much faster than a crossbowman can shoot. But no matter how skilled the individual bowmen, in battle it was the rate of fire that counted. Froissart described “their arrows so wholly [together] and so thick, that it seemed snow.” Jehan de Wavrin, an eyewitness at Agincourt (1415), wrote: “I am of the opinion that the most important thing in the world in battle is archers, but they must be in the thousands, for in small numbers they do not prevail.” The sound of a flight of arrows was said to be like the great wind before a tempest. Mass shooting, taking advantage of the war bow’s combination of power and speed, could be breathtakingly effective against cavalry. The Monk of Malmesbury suggests that typically 3 or 4 flights will break a mounted charge, six at the outside. Most of the damage was done to the horses, as witnessed by Froissart’s account of Poitiers, but armored men were injured as well. A bodkin point, striking armor at or near 90 degrees, can penetrate plate of a thickness typical of 14th century armor, but if the arrow does not strike cleanly, it can be deflected and can even shatter. 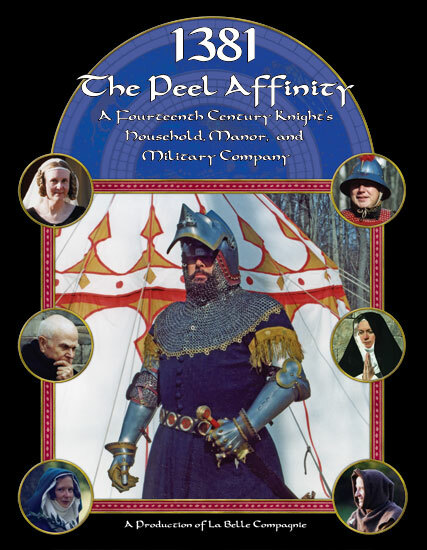 The practical applications of this were understood by medieval armorers, arrow makers, and bowmen. Armorers shaped armor to provide glancing surfaces. Arrow heads were carefully forged to have hard tips for piercing and keep a softer inner core to absorb shock. Reputedly, English bowmen sometimes put a small piece of beeswax on the tip of an arrow to stop the initial deflection. For a battle, the English liked to take a good defensive position and hold it, waiting for the enemy to come to them. They preferred to anchor the flanks on protective natural features. Froissart tells us that they used a formation called a herce, but unfortunately neither Froissart nor anyone else from the period explains the formation clearly. Archers were often deployed in terrain such as hedges, dikes, woods, and marshes that was difficult for their most dangerous foes, cavalry. When this was not possible, and sometimes even when it was, they strengthened their positions by digging holes, excavating ditches, and emplacing sharpened stakes. Once the archers were in place, the idea was to channel the enemy into the killing zones where a continuous rain of arrows falling on his front and flanks would destroy his momentum and cohesion. Any surviving soldiers reaching the English position would arrive individually or in small groups, and could be dealt with easily. What about an individual archer’s activities? Contemporary foreign observers report that English archers knelt before battle, made the sign of the cross, and then kissed the earth. Some say they would take a small bit of the earth into their mouths in token of their readiness to return to the earth. On a more practical level, an archer would prepare himself by freeing his arrows from their bags and stuffing them point down under his belt, laying them out on the ground in front of him, sticking the points in the ground so that the nocks were near at hand for quick shooting, or possibly using his foot to hold them in place (and maybe to keep his mates from swiping them).